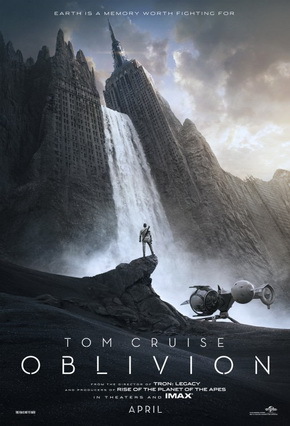 Tom Cruise stars in Oblivion, an original and groundbreaking cinematic event from the director of TRON: Legacy and the producer of Rise of the Planet of the Apes. On a spectacular future Earth that has evolved beyond recognition, one man’s confrontation with the past will lead him on a journey of redemption and discovery as he battles to save mankind. Jack Harper (Cruise) is one of the last few drone repairmen stationed on Earth. Part of a massive operation to extract vital resources after decades of war with a terrifying threat known as the Scavs, Jack’s mission is nearly complete. Living in and patrolling the breathtaking skies from thousands of feet above, his soaring existence is brought crashing down when he rescues a beautiful stranger from a downed spacecraft. Her arrival triggers a chain of events that forces him to question everything he knows and puts the fate of humanity in his hands.